Tanzania safari itineraries are guidelines to book wildlife safari tours. Cheap vacation safari bookings is possible when you choose low cost quality safari All Postslodges. Safari bookings in Tanzania are available in different travel package options.Booking Safaris in Arusha start by planning suitable itinerary. Arusha safari booking trip procedures are Safari lodge reservations, Airport transfers, Flight ticket bookings, VISA application and health checking. April and May are rain season and have huge discount of room rates on all Lodges, up to 50% discount is available. Safari itineraries are wildlife safari tour plans suitable for holiday makers. Safari itineraries varies according to number of days, travel destinations, tourist things to do, adventure safaris, walking safaris, sightseeing tours, camping safaris and lodge safaris. All these have different budget levels for every tourists pocket. Backpacker safari lodges are available on all safari itineraries, from 4 days safaris, 5 days adventure wildlife tours, 6 days lodge safaris and 7 days budget camping safaris. Discount Lodge safaris are available in May and June, plus November to December 10 in 2017. Arusha safari booking cheap lodge safaris in Months of May, June, November to December 10. Ask for cheap lodge safaris in May and June and save money on wildlife safaris Tanzania. Serena Lodge safari, Sopa Lodge Safari, Kati kati wilderness camps Serengeti, Karatu Hotel and mto wa Mbu Lodge or camps. Affordable safaris booking on quality safari lodges meets your budget and saves money. 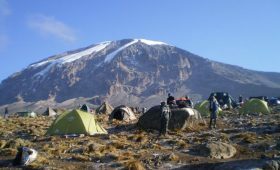 Ask for budget Kilimanjaro climbing trips, choose favorite Kilimanjaro trails of Machame, Rongai and Lemosho. Safaris Tanzania, complete information on adventure safari itineraries. Diversity of wildlife safari destinations, Tanzania safaris, safari itineraries to choose. Travelers and Tourists looking for Safaris Tanzania can get complete information on adventure safari itineraries with diversity of wildlife safari destinations to choose. Tanzania Safari information on wildlife: Kilimanjaro Tanzanite Safaris Ltd (KTS) offer you a wide range of excellent Tanzania safaris game lodges budget camping and tented campsite accommodation to choose from. KTS can arrange you different standards and quality of Tanzania travel accommodation, each directly resulting on the total safari travel costs, all comfortable and enjoyable. All together offer maximum wildlife viewing tours, and enjoyable vacation holiday in Tanzania. From Budget tanzania safari itineraries, climbing Kilimanjaro routes, beach holidays and adventure nature trekking trips in Tanzania, tourists have variety of travel packages to choose from. Tanzania safaris packages varies in prices and length of days. It depends how long your vacation holiday lasts. There are last minute tanzania safaris booking, reserve rooms in safari lodges and everything goes smooth for last minute safari bookings. Either you can reserve your tanzania safari and pay with Credit Card via Moneybookers. Reservation of Tanzania safari tour is easier and trust worth as we use secure gateway. We have a small fleet of well maintained four wheel drive vehicles staffed by experienced driver/guides who have intimate knowledge of the National Parks of Northern Tanzania. Our fleet of Land Cruisers and Land Rover 110 TDI’s makes it possible for us to provide reliable transport into the remote areas in which we operate. They are all equipped with a roof hatch for optimum game viewing. Each vehicle has seven seats but we recommend only four people for comfort and access to window seats. 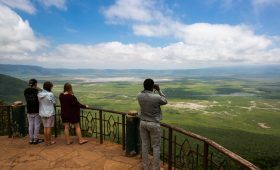 Here are some itineraries which cover the main parks, but of course we can plan anything from a two night visit to Ngorongoro Crater to something much more extensive. Just let us know what you would like to do. We shall advice you!